"Excellent business hotel. Good for sightseeing and close to the airport. Great room. Awesome vibe." "Great location near the airport." Near enough to the city centre, with great sightseeing, shopping, and dining. Average parking. "Excellent vibe and pretty inviting atmosphere. Modern Hotel." Stylish hotel. Pleasant entrance area. Good for business people. Good choice for a city trip. Perfect airport hotel. "Spacious, tidy, modern rooms. Bathroom is relatively clean." Great kitchenettes and minibars. Furniture needs more attention. Shower was ok. Rated 79/100 based on reviews from families. Rated 79/100 based on reviews from couples. "Excellent vibe and pretty inviting atmosphere. Modern Hotel." Stylish hotel. Pleasant entrance area. "Great location near the airport." Central location with great sightseeing, dining out and shopping. Average parking. Rated 80/100 based on reviews from couples. Thank you for taking the time to share a review of Home2 Suites Charleston. We are very fortunate to have Tom on our team. He truly cares about our guests and it shows. I hope you will return for another visit soon. Blood was on our sheets, the front desk agent that night just sent new sheet up. We had to make our own bed. Utilizes were filthy, hair was in tub and sink. Told front desk they seem as if they didnt care. Will not be back!! Thank you for letting us know about the issues with your guest room. We do care....we care very much about guest satisfaction. It is our entire job to try and please every guest. So much so that we have a 100% guarantee. The Home2 Guarantee is our pledge to you that we will provide you with the best possible service and accommodations, and do everything in our power to make sure that happens.” Once we were informed of the issue we responded in the best way possible in that moment in time and felt so bad about the problem that we offered an amends by adding additional Hilton Honors points to your account. We don't always get everything right but we absolutely try our best and learn from the experience. Please accept my apology and the apology of our housekeeping team for the issues you experienced. Ok Nice facility. Outdoor pool only. Breakfast = 1 on scale of 10. Room very average. Did not feel like car was safe based on immediate surrounding area. Carpets need better cleaning. Good shower & restroom area. Thank you for staying with us. I am sorry to hear about these issues during your stay. I hope you'll accept our sincerest apologies. I will follow up with your concerns. The Home2 Guarantee is our pledge to you that we will provide you with the best possible service and accommodations, and do everything in our power to make sure that happens. I hope you will give us another opportunity in the future. A second to none staff with exceptional skills in hospitality. They bend over backwards to ensure a good experience. Their Sales Manager, Tom, is a joy to be around, very friendly, super helpful, and obviously paired perfectly with hia chosen profession. We have been here for almost 6 months over the last year+ because of two major house catastrophes and they made us feel at home and at ease, so we could deal with the stress of what was going on with major house renovations, insurance, etc. Gracious and wonderful place to stay in the midst of such a difficult situation, for us and our children. Highly recommend! Thank you for taking the time to share a review about your experience at Home2 Suites Charleston. It has been a pleasure to host your family over the past year. I enjoyed my stay at Home2 Suites! I absolutely love their rooms. The space is amazing and great for families. The staff was really helpful the entire stay. They consistently checked to make sure we were okay. I look forward to staying here again. Thank you for the wonderful review. At Home2, we want to change the way people think about extended stay travel. It’s a fresh take on feeling at home on the road. I am so glad that you enjoyed your stay. We look forward to welcoming you back again. With a stay at Home2 Suites by Hilton Charleston Airport/Convention Center in North Charleston, you'll be within a 5-minute drive of Charleston Tanger Outlets and North Charleston Coliseum and Performing Arts Center. This aparthotel is 9.1 mi (14.7 km) from College of Charleston and 9.3 mi (15 km) from Charleston City Market. Make yourself at home in one of the 122 air-conditioned rooms featuring kitchenettes with refrigerators and microwaves. Wired and wireless Internet access is complimentary, while iPod docking stations and cable programming provide entertainment. Conveniences include desks and separate sitting areas, as well as phones with free local calls. Be sure to enjoy recreational amenities including an outdoor pool and a 24-hour fitness center. Additional amenities at this aparthotel include complimentary wireless Internet access, a television in a common area, and barbecue grills. Guests can catch a ride on the complimentary shuttle, which operates within 5 mi. Featured amenities include complimentary wired Internet access, a 24-hour business center, and express check-in. A roundtrip airport shuttle is complimentary (available 24 hours), and a train station pick-up service is also provided at no charge. The Charleston International Airport is located 2 miles from the Home2 Suites by Hilton Charleston. We offer a complimentary 24 Hour Airport Shuttle. Local Shuttle Info: Our Complimentary Shuttle can take guests anywhere within a five mile radius. We offer free Wi-Fi Internet Access for all Hotel Guests. The Home2 highlights above are subject to change without notice. 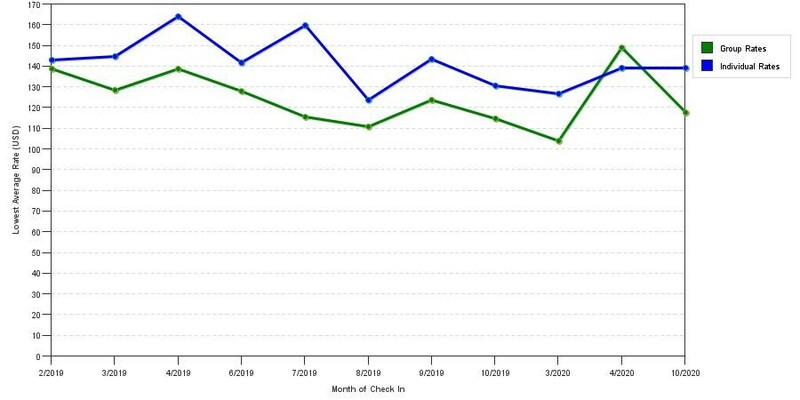 The chart above shows fluctuations of prices for both group/meeting rates and the best individual traveler prices we could find at the time the group/meeting bid was placed. The most competitive group/meeting rate displayed is 40.8% in the month of February 2018 and the highest average individual rate is $176 in the month of June 2019. This chart will show past seasonality and also project future months. If you are flexible with dates, you may want to consider staying at Home2 Suites by Hilton Charleston Airport in a month when rates are lower.